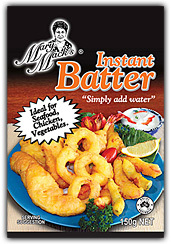 To make enough batter for 1kg of chicken or fish you will need 150gms of Mary Mack’s Instant Batter and 300mls of water. Pour 150gms of batter into a bowl and then add the 300mls of water. Whisk for a minute. Any lumps that may still be in the batter, they will disappear in the cooking. Please remember that the amount of water will determine the thickness of the batter and if after a test run you find that the batter is too thick for your liking just add a little more water or if you think it is too thin then add more batter. You can modify the thickness of the batter you select for your food in this way and this will not affect the crispness or texture of the batter. Flour the food to be battered. Dip the floured food into the batter, covering it well, and then it is ready for cooking in hot oil. For shallow frying you will need between 50mm to 100mm of hot oil. If you are using an electric fry pan with a thermostat the number 8 usually is a good cooking temperature. If a thermostat is not fitted a good rule to follow is to put a little batter into the hot oil and if it rises quickly to the surface it means the oil is hot enough for the batter but if it comes up slowly it needs more heat. When the heat of the oil is correct put the battered food into the hot oil. When you are shallow frying its always good rule to let the food stay in the one position in the fry pan for a minute at least. After this time you will find you can put a spatula under the food and it can be easily turned over. At any time do not try to turn the food over before it can be easily lifted with the spatula under it as this will result in the batter coming away from the food. If after filling the fry pan with battered food you find that you're losing heat due to the absorption of the temperature of the food, compensate by turning the thermostat up to its fullest capacity. This is because the battered food has taken some of the heat out of the oil. The suggested temperature when using a deep fryer is 180 C and always remove the wire basket avoiding the raw food becoming entwined when first put into the deep fryer. The oil should be deep enough for the product to float while cooking. Depending on the thickness and size of the pieces of fish or chicken most pieces take between 3 to 5 minutes to cook. The finished product should have a crisp golden look and will retain this appearance in a holding unit for a considerable time. 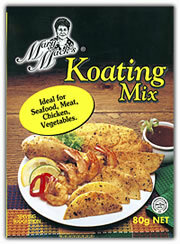 Put a small amount of Mary Mack’s Koating Mix say 80gms on to a plate or into a plastic bag. Moisten food with water and without overcrowding the plate or plastic bag roll the wet food into the Koating Mix. Cook in some hot oil. For shallow frying around 50 mm of oil will suffice. Lower the prepared food into the hot oil, turning the food over so that both sides can cook. Do not turn food over too soon as you need to give the Koating Mix time to firm on to the product. The cooking temperature should be around 175 C or usually around 7or 8 on your electric fry pan. An average piece of fish around 200gms will take around three to five minutes to cook, chicken will take around 10 minutes for 200gm piece. With deep frying you can put the prepared food into a cooking basket before lowering into the hot oil. Once again the oil should be around 175C. You may wish to bake or roast in the oven. Prepare the food and place on a baking tray sprinkling a little oil over the food and put into the oven ,with the temperature at around 180C.